Hatters striker James Collins will keep it purely professional when he heads back to former club Crawley Town for the first time tomorrow. The 26-year-old scored 22 goals in 51 games during a stellar campaign for the Red Devils last year, before Luton came calling for his services during the summer and he made the switch to Kenilworth Road. It wouldn’t be anything personal if I did celebrate against Crawley, it’s just one of those things. 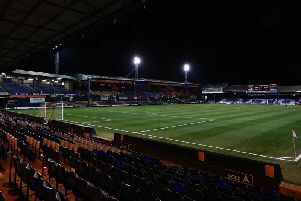 With Luton now on top of the League Two table, Collins knows he made the right move in leaving for pastures new, and will be doing all he can to get on the scoresheet once more as he said: “I’m looking forward to going back there, I had some good memories there last year, so it will be a tough game. “Of course I do (want to score), I want to score goals every game, no matter who it’s against. “Crawley were good for me last year, I like to think I was good for Crawley last year, so no grudges, but I want to go there Saturday and win the game. “I feel I made a big step up, to a massive club and that’s no disrespect to Crawley, it’s just the size this club is, it’s definitely a step up. If he does add a ninth goal to his personal tally this season, then Collins didn’t anticipate not celebrating, as some players do against their former sides. He continued: “I think football’s football and you’ve got to celebrate when you score a goal. “It wouldn’t be anything personal if I did celebrate against Crawley, it’s just one of those things. The Red Devils have had a change in manager since Collins left, with Dermot Drummy departing in the summer and former Leeds, Liverpool and Australia winger Harry Kewell taking charge. Town’s striker still knows plenty of the squad at the Checkatrade Stadium though, although doubts he’ll be offering any insight to the Luton boss on tactics ahead of the clash, saying: “There’s a few there, he’s made a lot of changes, but there’s still a good number there that I worked with last year, and I made some good friends there. “I don’t know who’s going to play as they got beat Tuesday, so the gaffer could make a lot of changes. Hatters go into the game on the back of two thumping victories, battering Stevenage 7-1 last Saturday and then hammering Exeter City 4-1 on their own turf during midweek. For Collins, it’s showing that the discussions he had with Jones prior to signing are coming true now, as he said: “When I met the gaffer in the summer, he said, we will create lots and lots of chances and we want you to be the ones to put it away, on the evidence of the last two games that’s the case. “At the minute, it’s a great team to play in and hopefully that can continue. Importantly, the goals are being shared round too, as although Collins and Danny Hylton have 16 between them, the rest of the squad have added 18 between then too. With the likes of Elliot Lee also waiting patiently for his chance too, Collins knows the players in possession of the shirts can’t let things slip, as he added: “That’s part and parcel of being as such a club. You’re going to have a good squad and we’ve got some good players that are not playing at the minute. “Me, Danny and Harry (Cornick) have got the shirts of the front three at the minute and it’s going to be tough to keep that going, but luckily enough at the minute, we’re doing okay and hopefully that will continue.